· Setting concrete goals matter: Early on in the initiative (8 years ago), A. G. Lafley, CEO of P&G, set a concrete goal for open innovation: More than 50% of technology and product innovations should come from outside P&G. At that time in 2000, 15% of innovations came from outside. P&G has exceeded that goal in 2008 (perhaps earlier). · Be open to all kinds of partnerships even with competitors: Ashish told us 3 success stories that came out of Connect + Develop. In two out of those three were stories; P&G collaborated with its competitors. For example, P&G wanted to put to use a promising technology called Impress. It’s plastic food wrap with tiny adhesive-coated dimples that seals surface rather than just covering it, preventing awkward clumping characteristic of competing products. P&G wasn’t in food wrap business. Hence, the first thought was to create a new brand. However, it realized that it would take too long and be too expensive. Instead P&G formed a joint venture with its competitor Clorox, the maker of Glad household products by taking 20% stake in the business by contributing IP and cash. It placed two managers on Glad’s operating team and P&G employees made up nearly half of Glad’s R&D team. Result was Glad Press’n seal wrap and Glad Forceflex. Today Glad is a billion dollar brand, up from $650 million. · Moore’s law for sustainable relationships: When an $80 billion company like P&G partners with SMEs, it is quite possible that the SME feels threatened. In fact, some of the failures resulted from not structuring the deals in a fair manner (P&G trying to eye larger pie). Hence, P&G is now extra cautious in being flexible with IP rights and deal structure with partners. In fact, Ashish mentioned Moore’s law applied to collaboration: Second deal with same partner takes half as long and is worth twice as much as the first. Currently, C+D initiative is in 2.0 phase and has following 4 key focus areas: (1) Partnerships with SMEs (2) Capabilities and services (3) Knowledge partnerships (4) C+D with universities. In India, P&G is focused on (2) and (3). It has partners for modeling services (what if analysis like how would a shaver look like when designed like this). Similarly, it works with CSIR as a knowledge partner. 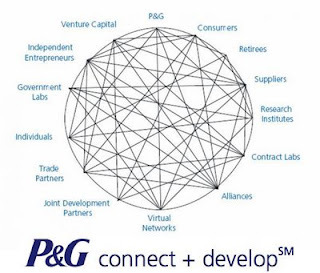 “The Game-Changer” by A. G. Lafley and Ram Charan is the best source on P&G’s innovation initiatives.